TRIN: I've already listed some of my favourite books of 2008 in Thea and Anna's Smugglivus post, but as soon as that list was posted, I realised I forgot to include some of the other books I've read last year as well. So, here goes: the full list of my favourite books of 2008, in alphabetical order. Ender's Game (1985) by ORSON SCOTT CARD: I enjoyed this one greatly, but sadly never wrote a review for it (though I plan to do that after a re-read). It's one of the classics of the SF genre, but I didn't even know it existed until last year. The funny thing is that despite my love for this book, I don't plan to read any of the following instalments, at least not in the near future. Probably because I doubt they can get any better than Ender's Game. Flowers For Algernon (1966) by DANIEL KEYES - Another classic! (In fact, about half of this list is made of classics … I'm slowly discovering some great things that others read ages before. I blame it on not being from US/UK.) Also, one of the first reviews I wrote. I suspect it'll stay one of my all time favourites, because it's one of the best books I've ever read. Heroes Die (1998) by MATTHEW WOODRING STOVER – I'd never have thought that such a great book can hide behind such a funny cover. I can't get the second installment anywhere, though, since it's out of print, and I'm not going to read the third one without reading the second one first, so I'm kinda stuck. I also don't want the e-book (what good is an e-book without an e-book reader? True, I could spend some extra hours at the computer screen, but that doesn't sound very appealing to me) – as someone said: I need a dead tree in my hands when I read. Sorry, trees. 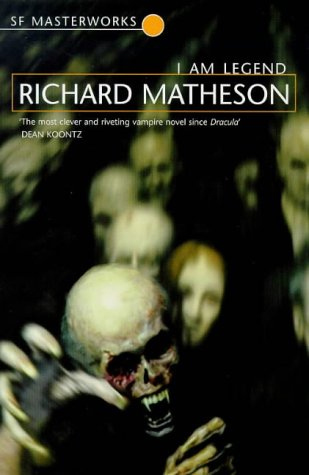 I Am Legend (1954) by RICHARD MATHESON – A classic again, and one of the rare 'horror' books we've reviewed on RoSF (I don't really think it a horror book, but I can hardly call it sf or fantasy …). I find it funny that at the time of reading it, I was perfectly sure that it was written in the 90s and kept asking myself why doesn't he use some technology. Hah! Also, I didn't watch the movie – I mean, they failed at choosing the main character (Neville from the book has pale skin, blue eyes and blond hair), so I didn't want to know at what else they've managed to fail. Orphan's Tales (2006, 2007) by CATHERYNNE M. VALENTE – Finally, a book (two of them actually; Book One: In the Night Garden and Book Two: In the Cities of Coin and Spice) that's pretty fresh! It's a criss-cross between a fairytale storybook and 1001 nights (which could also be called a storybook, I suppose), written in a very poetical language. Very nice. Otherland (1996-2001) by TAD WILLIAMS – This series has been sitting on Thrinidir's bookshelf for quite some time, but it never seemed really interesting to me. Thrinidir, however, insisted that I should read it, and I finally did so in the last days of 2008. I'm glad that he insisted. The Road (2007) by CORMACK McCARTHY – I can't believe I almost forgot to include that one. Another one of my beloved post-apocalyptic books with a sociological note and a beautiful story. I can't wait to see what the movie will look like. The Steel Remains (2008) by RICHARD MORGAN – An actual 2008 book :) I loved every part of it – the realism, the explicit language that went with it, the characters, everything. A thought: there can hardly be any strange slash fanfic written for this one. The Terror (2007) by DAN SIMMONS – I've read Hyperion and Fall of Hyperion before this one, but it's The Terror that made me a real fan of Simmons'. The only book I've read and re-read in 2008. Wasp Factory (1984) by IAIN BANKS – Not sure if this is speculative fiction at all, but I nevertheless loved it. I can't explain what's so great about a book where almost everyone is obviously crazy, though, but Banks is one hell of a writer who managed to successfully pull the whole thing off. MADWAND: Even though I managed to read only a few books in 2008, there was one that stood out; Scott Lynch's The Lies of Locke Lamora (2006). I should thank Thrinidir for having been such a pest [Thrinidir: "Oh rlly? "]: he has continuously badgered me about this book until I caved in and finally read it. Locke is a young thief whose talent is recognized and nurtured by a con artist, Chains. A man with a vision, Chains moulds Locke and the other orphans he took under his tutelage into a group of confidence tricksters feared by the wealthy nobility. But then the plot thickens... :) Lynch did manage to spoil the experience near the end, but the overall impression was a very positive one. How can one not like a well written tale of charismatic con artists set in a fastastic rendition of Venice? THRINIDIR: I don't read as much as some of the people I know and I'm not as genre knowledgeable as others, so I wouldn't take my year's pick as a definite indicator of sublime quality or some other serious referential pointl (i.e. I'm not saying that the books I'll be highliting represent the actual top of the crop), but I'm doing this in hope that people will be able to find at least a few noteworthy suggestions to add on their reading list. Last Argument of Kings (2008) by JOE ABERCROMBIE. Though I was slightly less satisfied with the final volume of the superb "The First Law Trilogy" (Blindman was even more disgruntled by it) than with its two predecessors, especially "Before They Are Hanged", I still highly value Abercrombies' satirical wit, feel for characterization and utter disregard for what the endings should be like by the genre standards. This trilogy is definitely one of the highlights of the new millennium. The Painted Man (2008) by PETER V. BRETT. While I called this book light-weight and suffused with genre staples it is still one of the best - if not the best - fantasy debuts of 2008. This is book one of the "Demon Trilogy" and its main purpose is to set up the world and introduce the main protagonists, but here this is not that much of a problem, since the characterization is sublime and a few innovative elements are thrown into the mix with the genre archetypes. This is a traditional fantasy, but it feels modern without the explicit content that a lot of authors abuse to try and make their book distinguished from the genre classics (and the dross). The Shadow of the Wind (2001) by CARLOS RUIZ ZAFÓN. I'm in the process of writing a review for this monster of a book. What defines it as a monster isn't its length or even the inclusion of horror elements, but the richness of the prose and chock-full of thematic content and references. This is a book about life, but carefully hidden behind a mystery story that unfurles in the fascist Spain under general Franco. While not a fantasy, horror or science fiction book in the strictest sense of the word, it is still one of the finest books I've had the privilege to read in the past recent years. Highly recommended. Chronicles of the Black Company (the original novels were published in 1984,1984 and 1985; the omnibus was published in 2007) by GLEN COOK. In a recent review of the "Black Company" books that I've came across the author of the article refers to these books as a "...revered ancestor that should be honored as well as awarded a significant place in the history of the genre, but they shouldn't be (re)visited often, because while they left their mark on the genre, they have been outlived and outperformed by its successors." While I agree with this estimation to an extent, I was nevertheless left more appreciative (as opposed to the author of this review) of the Black Company and Glen Cook when I finished this terrific omnibus. While the Black Company books might be labeled as sort of an revered ancestor, I still think that they should be visited at least once, by anyone who loves down-in-the-trenches first person narrative, charismatic protagonist or simply put - great fantasy. The Road (2006) by CORMAC McCARTHY. The most evocative and touching book I've read in ages. Somber, moody, oppressive and primal, but never falling into the pit of pathetic. This is the book you need to read as soon you can. You really mustn't miss the sad journey of one father and his son following the road to nowhere in a fictional post apocalyptic world. Simply brilliant. The Mark of Ran (2004) by PAUL KEARNEY. Paul Kearney, who? I've never heard of this author before I've started following online book reviews; Adam from The Wertzone referred to Paul Kearney as one of the most under appreciated fantasy authors out there and every since I've decided to read "The Mark of Ran", book one of The Sea Beggars trilogy, I have to agree. After this book I've read two more of his titles ("This Forsaken Earth" and "The Ten Thousand") and each of them is marked by the distinctive quality of Kearneys writing. He is a master storyteller who knows how to weave a tale and I promise you, when you'll pick up a book signed by Kearney - if you haven't already - you will be everything but disappointed. Flowers for Algernon (1966) by DANIEL KEYES. If I'd have to pick a favourite book I read last year, it would arguably be this one. "Flowers for Algernon" is Daniel Keyes' opus magnum that won the Nebula for Best Novel (with Babel-17) in the year that it was published. This is, technically speaking, a diary of a man who undergoes a surgical procedure that allows him to slowly progress from a state of idiocy to become nothing less than a genius and then gradually regresses to his previous state. The author shows tremendous insight into the human condition and has a knack for making you care for the protagonist. This is an ingenious work of fiction, you just have to be smart enough to pick it up. I promise that the next article in the series (part 8, if I counted right) will be the last one; we only need to tally up all the books people refered to as special in 2008 and give you the final numbers (i.e. the books that were mentioned on the most lists). Fortunately I read some of the mentioned books by myself and for these books we share our opinions. I like your list because it's a mix of old and new books. There are two books which aroused again my interest: Heroes Die by Matthew Woodring Stover and The Mark of Ran by PaulKearney. I pretty sure they are both somewhere on my never ending book list. I had to read FLOWERS FOR ALGERNON when I was in high school (MANY moons ago! ), but it's still one of my all-time favorite books. Glad you discovered it! ediFanoB: I also like the mix of old and new, that's how I usually read books; a few rising stars and then spice it up with a cherished classic. Karen: We're glad to :). tnx for dropping by.